Marvel has been churning out superhero movies at a rapid pace. The films range from dark and serious such as Captain America: Winter Solder to wacky and outrageous such as Guardians of the Galaxy and Deadpool. Thor: Ragnarok is definitely in the wacky camp (which is ironic considering the plot revolves around the apocalyptic destruction of Asgard). The movie is silly and self-aware which makes it the best Thor movie yet. In fact, you get three movies in one: A war epic, a buddy comedy, and a prison escape film. The movie opens with Thor speaking directly to the camera from a dangling prison cell. His monologue serves to fill in the gaps in the two years since Avengers: Age of Ultron. But our hero is not breaking the fourth wall à la Deadpool. It turns out that he’s actually conversing with the bones of another prisoner who met an untimely demise. The humor begins with a funny exchange between Thor and a giant fire demon (usually not the best being to joke around with). Thor quickly vanquishes his foe and begins his quest to save his beloved home. On Asgard, he stumbles upon a play in progress. In this bit of “fake news,” Thor’s brother Loki is being lauded as a hero and savior. The best thing about this scene is the cameos. Matt Damon plays the fake Loki, Chris’s brother Luke Hemsworth plays the fake Thor, and Sam Neill plays fake Odin. Thor notices the real Odin watching with delight and realizes something is amiss. I won’t spoil the rest of this scene for you, but I will mention that Loki has a penchant for shapeshifting. The movie kicks into high gear when we are introduced to Hela, played in a deliciously wicked manner by Cate Blanchett. Hela, the God of Death and Odin’s first-born, has returned from exile to claim her birthright and conquer the nine realms. In their first encounter, Hela, thrashes Thor and Loki. After this battle, the two defeated brothers end up on the planet Sakaar. Cue buddy movie and prison escape film. Thor is captured by an alcoholic Asgardian Valkyrie (Tessa Thompson) and turned over to the Grandmaster, a brutal, eccentric alien dictator, who wields a “melty stick.” Jeff Goldblum is perfect for this role and takes the film’s wackiness to another level. 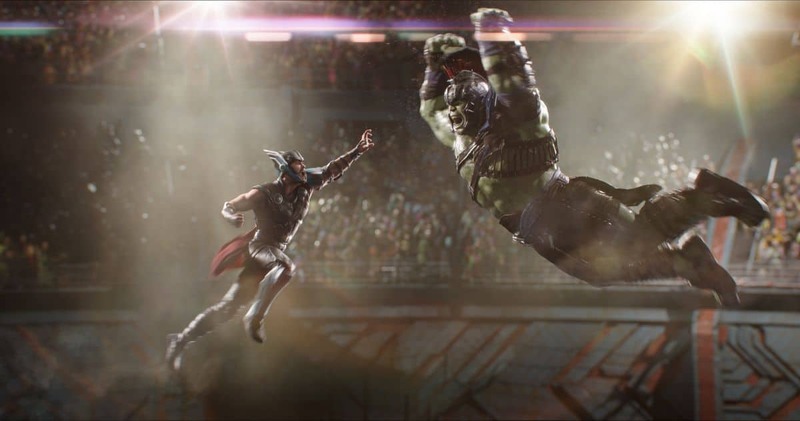 While on Sakaar, Thor reunites with Hulk, his “friend from work.” Of course, they are pitted in a fight to the death, but sometimes the workplace can be brutal. Some of the best moments of the film are between Thor and Hulk (as the raging green monster and as Bruce Banner). The characters bond by sharing insecurities. I know it sounds weird for a Norse god and someone who loves to smash to have such conversations, but it works in the context of this film. But Sakaar is just a temporary stop. 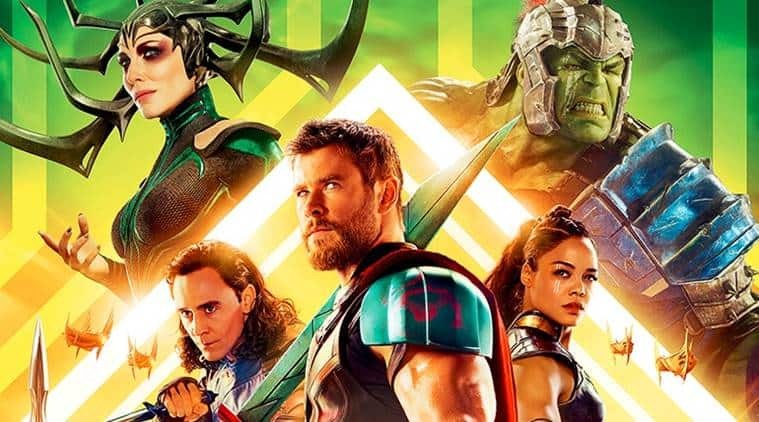 Thor manages to convince his ragtag team of “Revengers”- Hulk, Valkyrie, and Loki, (who had obtained the favor of the Grandmaster) to escape the planet and travel to Asgard to help him defeat his evil sister. Even though the rest of the movie is a typical third act battle scene, the humor doesn’t cease. In the midst of total annihilation, Thor: Ragnarok manages to remain irreverent and fun. P.S. – For those who are interested, Thor: Ragnarok does include the obligatory, shirtless Hemsworth scene.